Although it’s officially the first day of October, I’m sharing a tour of my late September garden and pond. 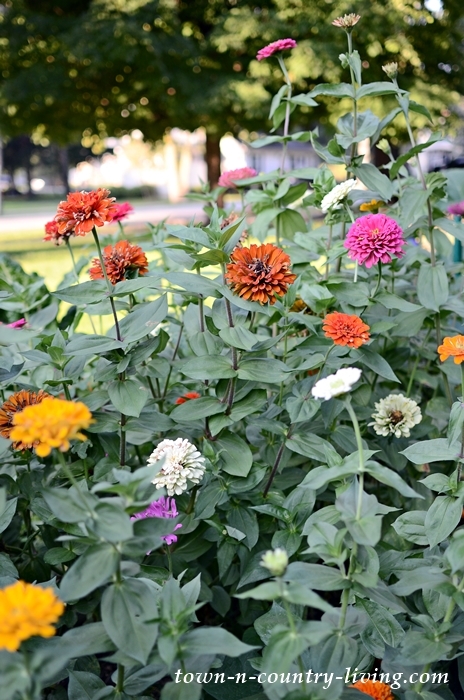 The State Fair zinnias are still going strong in our cutting garden. 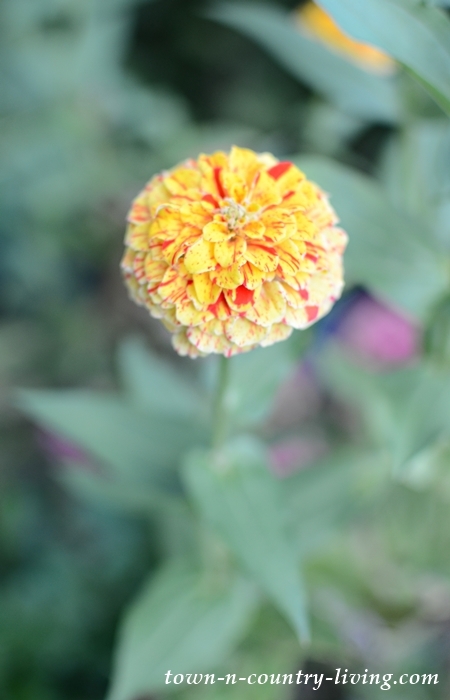 This is my favorite zinnia variety. They grow up to five feet tall and the more you cut them, the more they bloom. I have a couple more varieties of zinnias in the garden. I love the speckled look of this dainty bloom. I’m going to miss these cheerful blooms once the first frost claims them all. Hubby doesn’t know it yet, but next year I’m expanding the flower garden. I’ve already decided I want to be one of those little old ladies with a yard full of carefree flowers. I believe we’re caretakers of God’s beautiful Earth that He’s given us. Planting and growing things reminds me of God’s creativity and all the wonderful varieties He made. 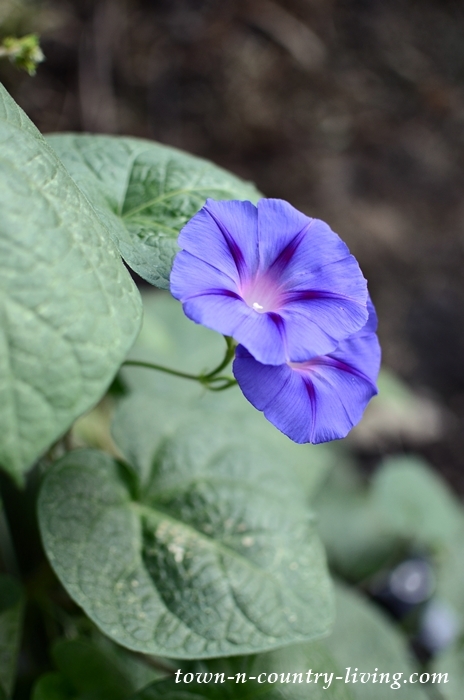 Morning glories popped up in several spots in the garden. 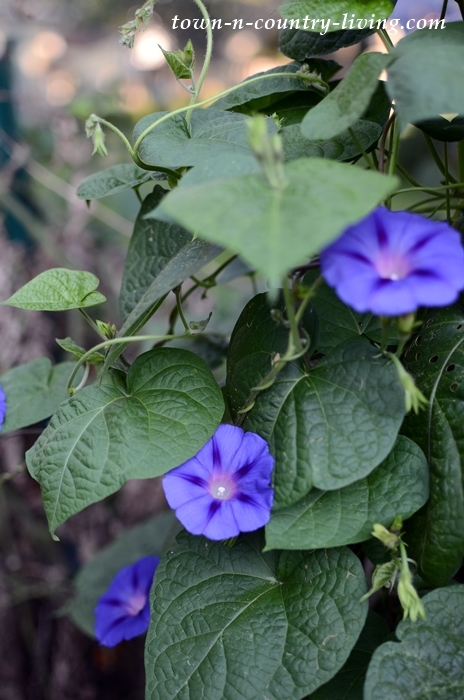 These pretty flowers wear such a divine shade of blue. They tend to re-seed and come back every year. Several people have told me they purposely take walks past our yard to enjoy the garden. It makes me happy to hear that I was able to brighten their day in some small way. 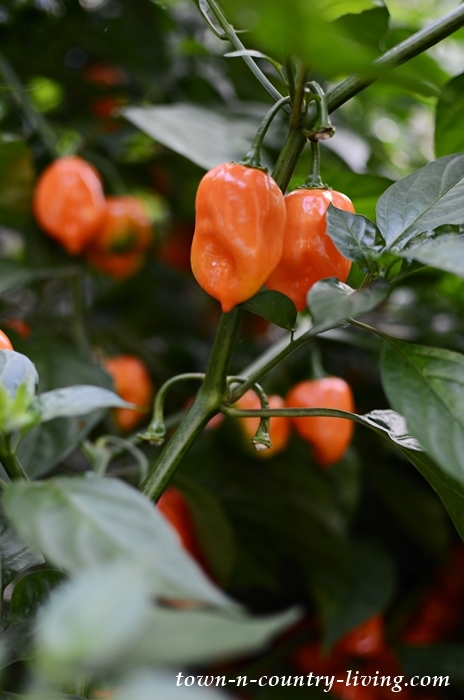 We’ve been harvesting peppers the past couple of weeks in our September garden. These habanero peppers are too hot for my taste buds but hubby loves them. I sometimes use them in my fall decorating since they remind me of little pumpkins. Remember this vine that I showed earlier in the summer? 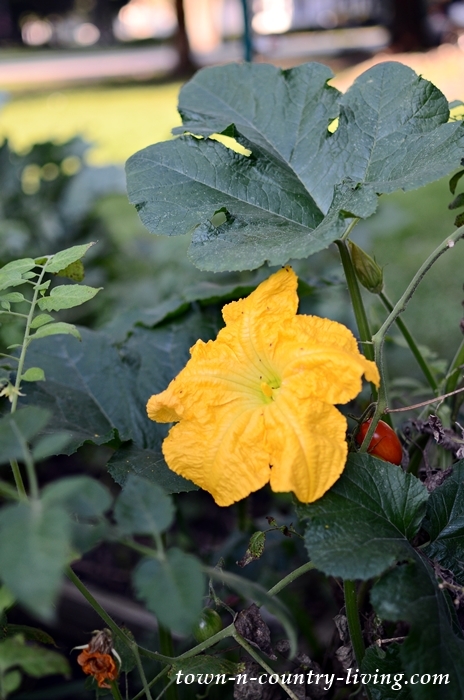 It came up out of nowhere and I thought it was either a butternut or spaghetti squash vine. I was wrong on both counts. The vine has large, gorgeous yellow blooms. Can you guess what it is? 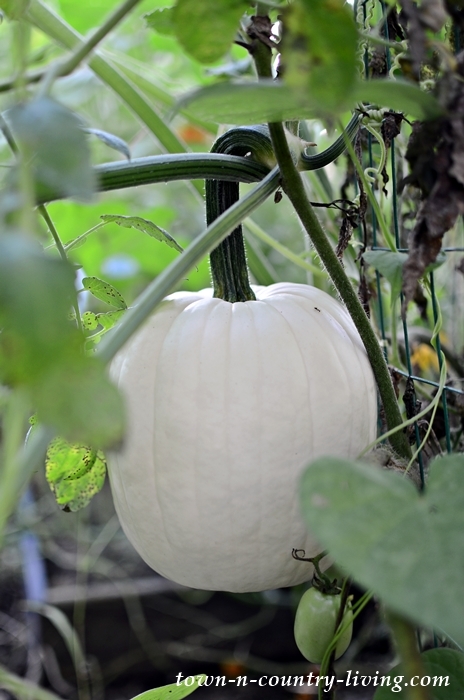 It’s a white pumpkin vine!! To say I’m thrilled is an understatement. I’ve never grown pumpkins and an errant seed from last year’s white pumpkins from the farmer’s market must’ve dropped into the garden. 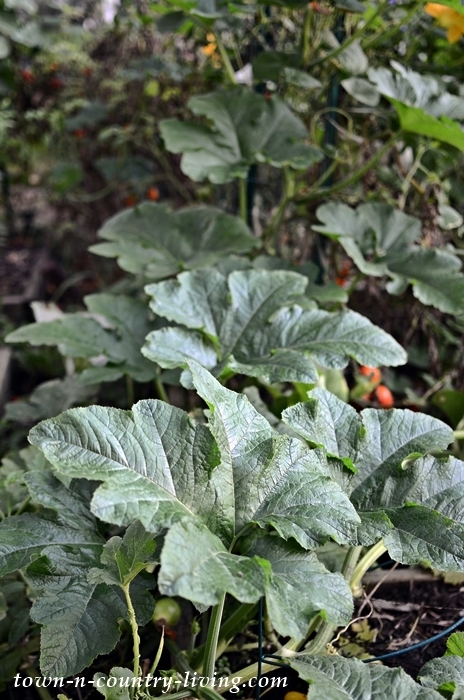 This is the second pumpkin I’ve pulled off the vine and there appear to be a few more growing in my late September garden (if the squirrels don’t eat them first). 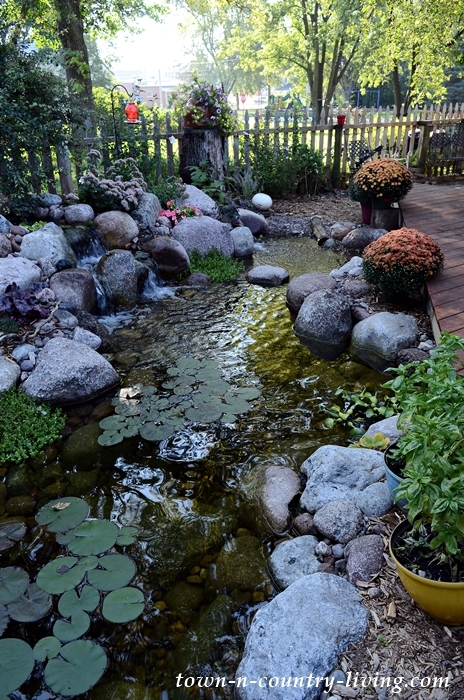 In the backyard, we’re still enjoying the pond and new deck. Hubby added a hummingbird feeder and they visit every day. 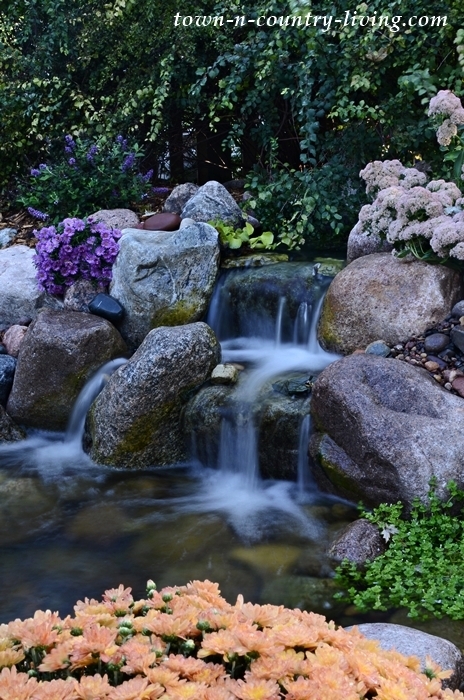 Chrysanthemums still look great and the sedum at the top right of the waterfall are just starting to deepen in color. I planted two waterlilies in the garden pond. The smaller one bloomed already and now the second waterlily has a bud ready to open any day. I’m anxious to see what color it will be. I have to confess, I smile every time I step into our backyard, pinching myself to make sure I’m not dreaming. I hope you’re enjoying the first month of fall. Our weather is wavering back and forth between 60-degree days and 80-degree days. Halloween can be nice and warm, or cold and snowy. And speaking of Halloween, I’m sharing my first-ever Halloween home tour on Wednesday! I had so much fun putting it together for you! Simply beautiful! I enjoy your blog so much , and also your love of flowers and the land! Beautiful, beautiful garden!!! I’d be pinching myself as well!!!! I have a backyard pool that takes up most of our space…I have a love-hate relationship with it. I love it for my granddaughters. They use it all the time and my hubby is in it multiple times a day….personally I would love to have a garden out there. Luckily we are a corner house which gives me two gardens (side and front) to mess around with! I planted everything fresh and new 3 years ago. This year it has really started to fill in beautifully!! I live in Canada and all the fall colours are coming out. Just stunning. Your gardens are just so beautiful. I have very few fall flowers this year since so much of my landscaping and flower beds had become so overgrown it was necessary to clear out much of it this Spring and Summer. Many were old plants and needed replaced. The 90 degree temps then did a number on what was left, plus my feral cats used much of my shaded greenery to escape the heat (evidently big-leaf hostas make cool and comfy cat beds) so next Spring I’ll have the fun of re-working most of it. You’re a natural when it comes to gardening. I’m sure your neighbors appreciate the beauty of your hard work. 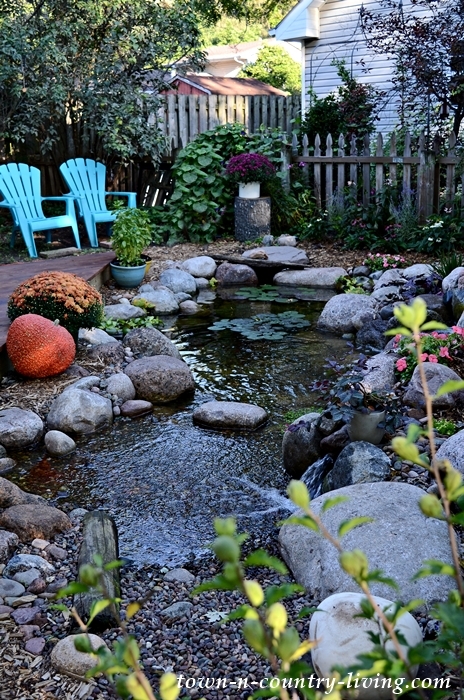 I’m so glad I found you…your garden and pond are absolutely gorgeous! What a lovely delightful garden! You and your husband have made a perfect eye candy inspiration. I am sure the hummers and other little creatures are appreciating you work as well. 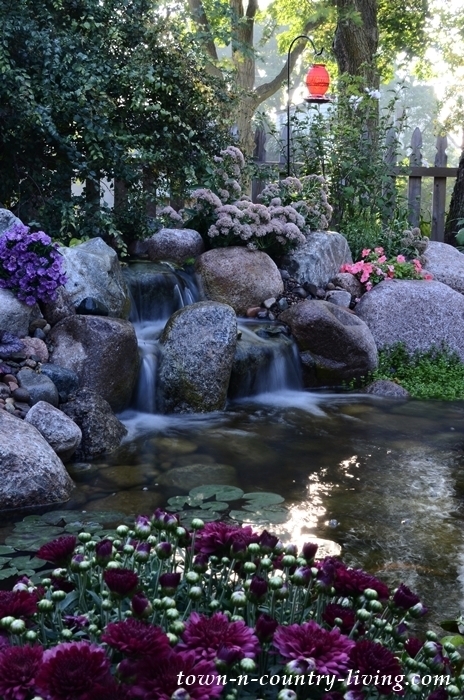 Just love your garden posts…your pond is so lovely, and I love your sweet spirit of sharing God’s love . There is s lot of hard work behind the scene, but your finished garden is gorgeous and worth every minute. Please know how much we appreciate you sharing in this lovely setting. And I guess if truth be known, we never FINISH our gardens do we? thank yo u ! 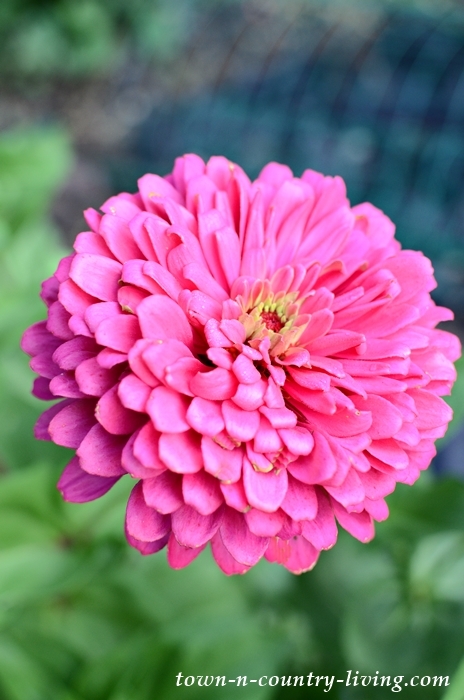 Thank you for the beautiful garden tour . . .zinnia are my favorite summer flower. Like you said the more you pick the more they bloom and they are such happy flowers. Then when you pick them and bring them into the house the bouquets hold up so well. I love morning glories, too and the fact that they reseed themselves each year . . . so sweet of them. Have a happy October and thanks for letting us hang out in your gorgeous garden. Jennifer your September garden is beautiful. All the flowers are pretty. Your pond area really is gorgeous. Fun having Koi isn’t it? Love the white pumpkin hanging. How exciting to have your very own white beauties to pick. Beautiful and so peaceful, thanks for these lovely pictures. It is amazing how things just show up in our flower gardens. Lovely, lovely garden! Very enjoyable to look at your photos! 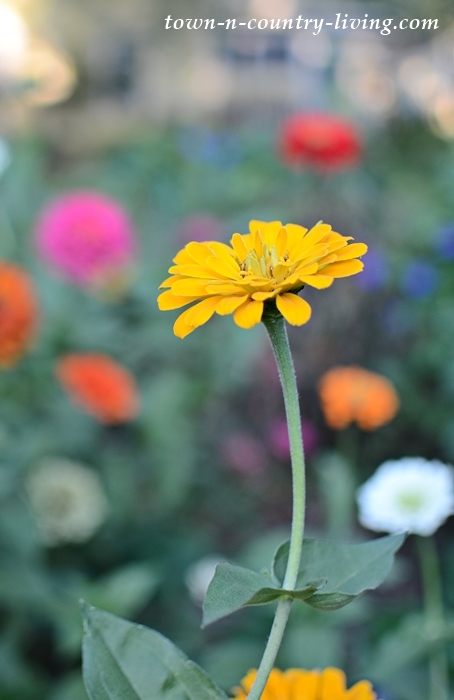 Where can I buy some of those tall zinnias to plant? So beautiful, peaceful and colorful. I’d be one to slow down and take a look if I was walking by. I’m loving your back garden with the pond. 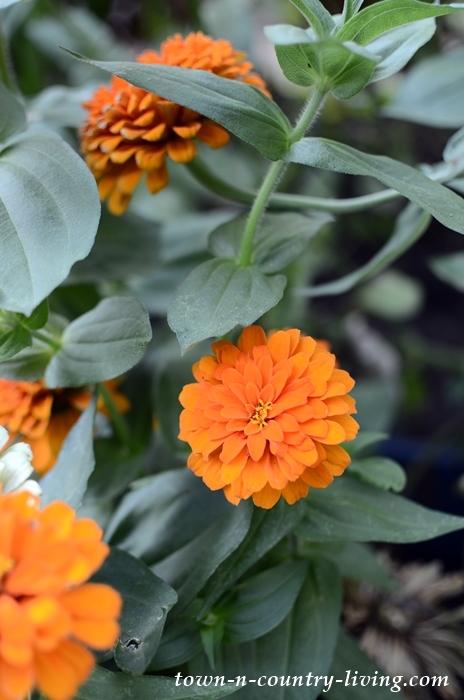 I’m also a zinnia fan but have found that the bugs are constantly eating on the leaves and they have a powdery mildew on them… I wonder what that’s all about… any suggestion for next year?? Thank for sharing your beautiful flowers, & your ponds are absolutely gorgeous! 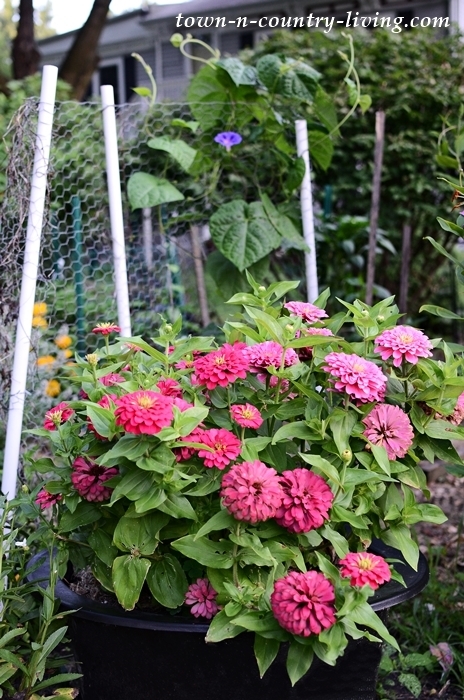 I would sooo love to have a patch not only for zinnias but also for dahlias. We could beautify a neighborhood in no time!